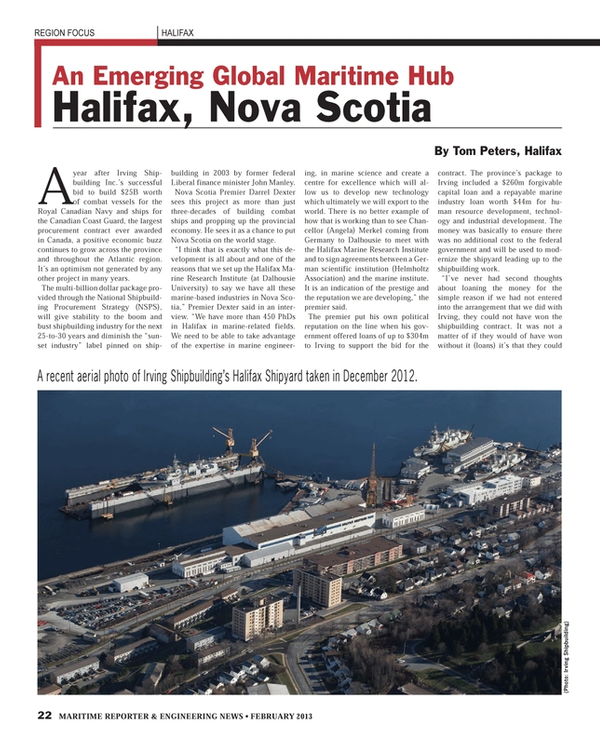 A year after Irving Shipbuilding Inc.’s successful bid to build $25B worth of combat vessels for the Royal Canadian Navy and ships for the Canadian Coast Guard, the largest procurement contract ever awarded in Canada, a positive economic buzz continues to grow across the province and throughout the Atlantic region. It’s an optimism not generated by any other project in many years. The multi-billion dollar package provided through the National Shipbuilding Procurement Strategy (NSPS), will give stability to the boom and bust shipbuilding industry for the next 25-to-30 years and diminish the “sunset industry” label pinned on shipbuilding in 2003 by former federal Liberal finance minister John Manley. Nova Scotia Premier Darrel Dexter sees this project as more than just three-decades of building combat ships and propping up the provincial economy. He sees it as a chance to put Nova Scotia on the world stage. “I think that is exactly what this development is all about and one of the reasons that we set up the Halifax Marine Research Institute (at Dalhousie University) to say we have all these marine-based industries in Nova Scotia,” Premier Dexter said in an interview. “We have more than 450 PhDs in Halifax in marine-related fields. We need to be able to take advantage of the expertise in marine engineering, in marine science and create a centre for excellence which will allow us to develop new technology which ultimately we will export to the world. There is no better example of how that is working than to see Chancellor (Angela) Merkel coming from Germany to Dalhousie to meet with the Halifax Marine Research Institute and to sign agreements between a German scientific institution (Helmholtz Association) and the marine institute. It is an indication of the prestige and the reputation we are developing,” the premier said. The premier put his own political reputation on the line when his government offered loans of up to $304m to Irving to support the bid for the contract. The province’s package to Irving included a $260m forgivable capital loan and a repayable marine industry loan worth $44m for human resource development, technology and industrial development. The money was basically to ensure there was no additional cost to the federal government and will be used to modernize the shipyard leading up to the shipbuilding work. “I’ve never had second thoughts about loaning the money for the simple reason if we had not entered into the arrangement that we did with Irving, they could not have won the shipbuilding contract. It was not a matter of if they would of have won without it (loans) it’s that they could not have won without that investment, and that will result in world class yard and secondly, will garner for the province $2.4 billion in revenue through direct tax benefits,” he said. Studies have shown that the long-term benefits to the province and region will mean more than just direct tax benefits. The Conference Board of Canada said following a study that the $25b combat vessel contract would generate an additional 11,500 jobs during peak production years in Nova Scotia and the province’s GDP would increase by nearly $900m annually during those years. A study by Jupia Consulting of Moncton, NB, said the shipbuilding program in Nova Scotia would grow the Canadian economy by $1.5b and create 4,500 jobs outside the province. There will be countless of companies, large and small, not only in Nova Scotia but throughout the region and even across Canada that will benefit from the economic spin-off. The activity has already begun. The contract has also generated a new training urgency. “You are now seeing young people who are demanding more seats in community colleges,” said the premier and in response the province has “made investments in new training modules for community colleges and we have a trades-based high school curriculum. We have many different avenues seeing economic activity. On peninsula Halifax, for example, we are seeing real estate prices move up in response to the anticipated work that will really begin at the shipyard next year,” the premier said. The work startup will never be too soon for the Halifax yard’s shipbuilders. CAW/MWF Local 1, representing approximately 1,000 workers, recently signed a new six-year collective agreement with Irving Shipbuilding Ltd. It was a big hurdle to clear for labor said Local 1 President Karl Risser and now the union can focus on keeping the federal government true to its word and fulfilling the contract. “The labor agreement was a big step on our behalf so now we’ve got to turn our focus back on (Prime Minister) Stephen Harper and the Conservative government and make sure they follow through on what they promised,” Risser said. And the labor spokesman said there is concern because of the country’s fiscal situation. “There may be some downsizing of the contract. I don’t think it will totally disappear but how many ships is definitely up for debate,” Risser said. “A lot of times governments make promises and governments can change. In 2015 there is federal election so it is all a concern to us and we have to make sure his (Harper’s) political agenda doesn’t knock-off the rails what the province has gotten,” Risser said. While the province gleefully rubs its hands in anticipation of the potential tax dollars and employment, the local business community has also embraced the project. Fred Morley, chief economist with the Greater Halifax Partnership, a lead economic development organization in the city, has referred to the $25b contract as “kind of our Hibernia,” in reference to Newfoundland’s offshore oil development. In the past several months the shipbuilding project has attracted international attention, Morley said. “Our observation has been over the last year that there have been “a lot of companies from around the world coming in and kicking the tires in Halifax around this project looking for opportunities, looking to become part of the project in some way,” he said. A vast majority of those companies have been from the U.S. and Britain, he said, but certainly interest from other parts of the world. Morley said the more than $300m being spent on the Halifax Shipyard upgrade in preparation for the actual ship construction is in itself a major project. “That is a fairly substantial project so a lot of the suppliers that are involved in that likely will be playing some role going forward as well. It is always good to remember that this is a big project with lot of workers and lot of suppliers. One of the big differences between the project there now and the shipbuilding contract is the shipbuilding goes on for 25 years,” he said. The biggest challenge, Morley says, will be “to make sure we reap the maximum benefits,” suggesting businesses need to get active, interested and involved. One industry sector looking to certainly be involved is the aerospace and defense industry, an industry that contributes well over $600m annually to the provincial economy with companies like L3, IMP, Composites Atlantic, Lockheed Martin and General Dynamics, to name but a few. He said his organization, which has 63 active members, can provide a number of services from metal work to highly sophisticated systems. He said about a third to a half of the association’s membership is capable of bidding on various projects associated with the contract. The ADIANS’ spokesman said he expects competition will be fierce especially with so many international companies from countries such as Spain, England, Germany, the U.S. and Denmark looking at this project. “A lot of those countries have existing classes of ships that they think are model designs the Canadians are looking for,” he said. “But regardless of who gets it, (the work) they have got to do a lot of their business here in Canada at some point and basically all content has to provide industrial regional benefits,” he said. “I speak predominately for Nova Scotia but the country as a whole is going see 100 percent of the benefits and when you think of spin-off business, those closest to the shipyard are going to reap befits just by proximity,” he added.